Gluten Free Bride- Having my cake & eating it too! Okay, so I’ve been MIA lately, but for good reason! My wedding is coming up in just a few weeks and all of the festivities have finally started to come together. Now, I don’t know how many of you are married or engaged, but for those singles out there- take this as a warning- Wedding planning is INSANE! Not only do you have to figure out guest lists, dress shopping, registries, etc., but being a gluten free bride has also come along with some interesting challenges! Now, I’m not going to get too far into all of the wedding planning craziness in one blog. However, I do want to talk about one huge gluten free obstacle we had to overcome! As anyone with food allergies can imagine, one of the most stressful hurdles to tackle was my gluten free wedding cake. I love my fiancé (if that wasn’t already obvious by his title), but he is not a huge fan of all things gluten free. We wanted the cheesy shot of us cutting our cake together and I didn’t want to “miss out” on this at all (so long as there is no smashing cake in my face). We agreed on a sweets table long ago- so our compromise was a gluten free wedding cake along with additional sheet cakes to be served at the sweets table. The sheet cakes would be all his decision, gluten free or not- hey it’s his wedding too! Trying to get him to agree on a gluten free cake though was surprisingly easy thanks to finding a gluten free bakery. So yummy! I would get engaged all over just to do this again! 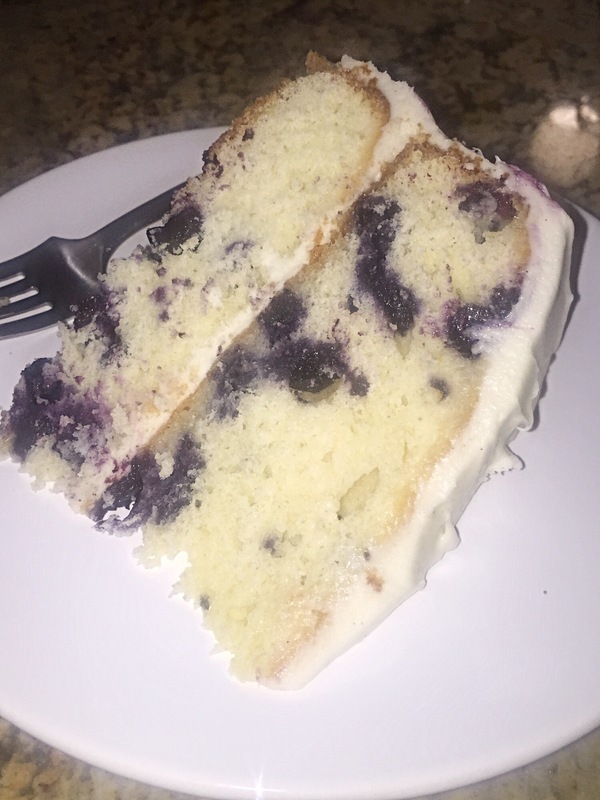 I’m fortunate to live in Chicago where there are plenty of gluten free bakeries around and we found an OUTSTANDING one not too far from our home. Elysia Root Cakes was wonderful to work with. Elysia Root Cakes does not have a retail store and work entirely on specialty cakes. When trying to locate their bakery we may have missed it had it not been for the brightly painted door!. However, when you walk in you are greeted with an incredible display of cakes, pictures of cakes, and aromas to make any diabetic nervous. 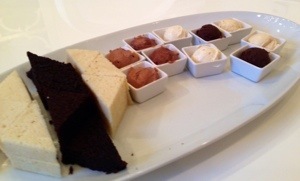 For our tasting we were able to request various flavors of cake and frostings which we were then allowed to pair together to “mix and match” to come up with our favorite combination. (In case you are curious, we chose almond, vanilla and chocolate cake along with Bailey’s, Chocolate, Vanilla Bean, and Nutella Buttercream as well as a Chocolate Ganache). Let’s just say my fiance did not want to leave until he ate EVERY bite she had offered us and, trust me, there was plenty!. Surprisingly, we agreed on the same combination and we are super excited (I’ll let you know which combination we chose AFTER our wedding! Don’t want to give too much away just yet!). I would definitely recommend Elysia Root Cakes to anyone- gluten free or not. She is wonderful and the cakes are delicious. We will definitely be back for our next big party! Here are some recommendations I have for gluten free wedding cakes and/or alternatives! Check with your local bakery! You would be surprised to see how many may be able to accommodate gluten free diets! If a gluten free cake is out of budget (unfortunately they can sometimes be an extra expense on top of an already expensive cake!) check out some gluten free cupcakes. Compromise! My fiancé loves me and would do just about anything for me. However, I do not expect him to be 100% gluten free and while I would LOVE a gluten free wedding, I have to remember that it is his wedding too. Sweets tables are a great compromise! For ours, we are incorporating a gluten free cake along with his favorite cake (not gluten free!) as well as other sweet treats! Chocolate covered strawberries are always a perfect solution! Remember it’s not your entire meal! How many gluten free options do you need?!?! Let’s be practical here and not break your budget on sweets! Throw in some yummy candy in decorative bowls and make sure to include your favorite gluten free treats! If you have them wrapped (think mini bars, etc) you don’t have to worry about cross contamination! PS- Ill let you know if anyone notices that it is gluten free!